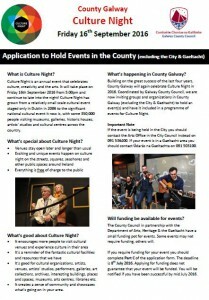 Culture Night is an annual public event that celebrates culture, creativity and the arts. It will take place on Friday 16th September 2016 from about 5.00pm to late into the night! 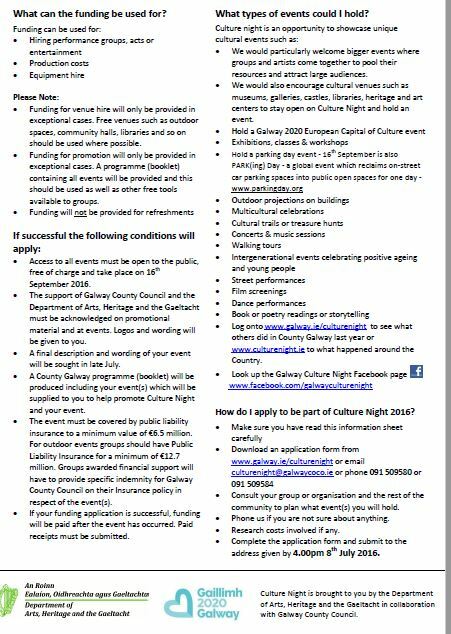 Galway County Council are now inviting groups, organisations and artists to submit an event to be included in the Culture Night Programme. 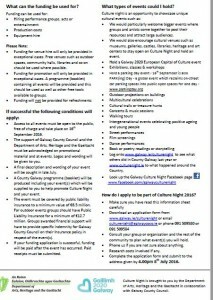 Funding for events is available. All events must be free of charge to the public. You can request an application form and further information by emailing culturenight@galwaycoco.ie or phone Valerie on 091 509580 or Breeda on 091 509584.